The Atmospheric Infrared Sounder (AIRS) is a grating spectrometer (R = 1200) aboard the second Earth Observing System (EOS) polar-orbiting platform, EOS Aqua. In combination with the Advanced Microwave Sounding Unit (AMSU) and the Humidity Sounder for Brazil (HSB), AIRS constitutes an innovative atmospheric sounding group of visible, infrared, and microwave sensors. The AMSU-A instrument is co-aligned with AIRS so that successive blocks of 3 x 3 AIRS footprints are contained within one AMSU-A footprint. 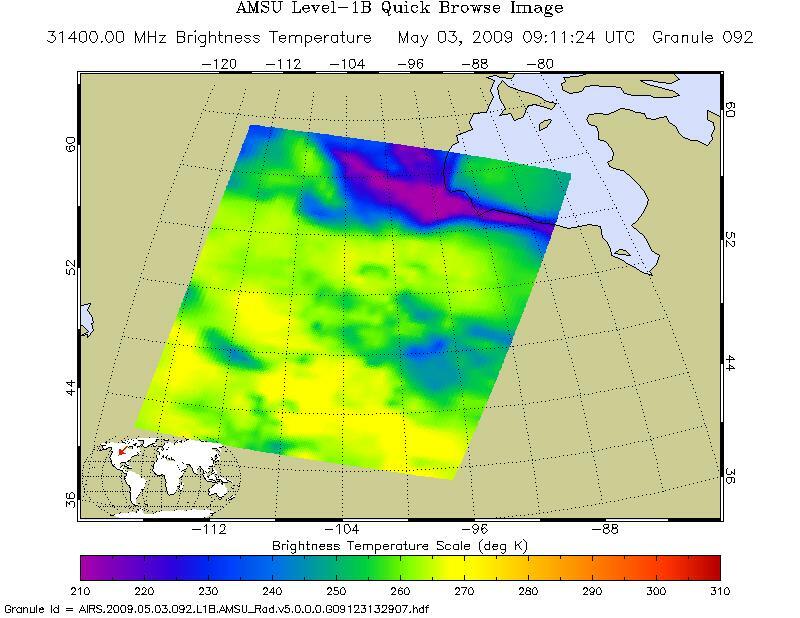 AMSU-A is primarily a temperature sounder that provides atmospheric information in the presence of clouds, which can be used to correct the AIRS infrared measurements for the effects of clouds. This is possible because non-precipitating clouds are for the most part transparent to microwave radiation, in contrast to visible and infrared radiation which are strongly scattered and absorbed by clouds. AMSU-A1 has 13 channels from 50 - 90 GHz and AMSU-A2 has 2 channels from 23 - 32 GHz. The AIRABRAD_005 products are stored in files (often referred to as "granules") that contain 6 minutes of data, 30 footprints across track by 45 lines along track.